Your diet plays a dynamic role on mood, emotions and brain-signaling pathways. 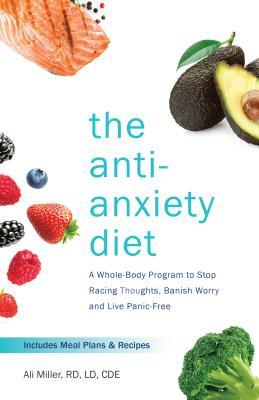 Since brain chemistry is complicated, The Anti-Anxiety Diet breaks down exactly what you need to know and how to achieve positive results. Integrative dietitian and food-as-medicine guru Ali Miller applies science-based functional medicine to create a system that addresses anxiety while applying a ketogenic low-carb approach. By adopting The Anti-Anxiety Diet, you will reduce inflammation, repair gut integrity and provide your body with necessary nutrients in abundance. This plan balances your hormones and stress chemicals to help you feel even-keeled and relaxed. Ali Miller is a registered dietitian (RD), certified diabetes educator (CDE), certified weight management specialist, and therapeutic lifestyle healthcare practitioner. Ali has dedicated her career to revolutionizing food-as-medicine in treatment and prevention of disease. She has a passion to create public awareness regarding the significant role diet plays in our overall health with her philosophy of Food-As-Medicine. She is the author of Naturally Nourished: Food-as-Medicine for Optimal Health Cookbook and the Reset, Restore, Renew: Real Food Detox program.